Today I spotted this cute bird in the Pepper Tree and was lucky enough to be sitting with the camera when it briefly perched in the tree, surveyed the scene and decided it was not safe to spend too much time hanging out. It hopped to another branch where it was briefly joined by two others and then they all took off. I assume that I only attract common garden birds to my garden. I’m right slap bang in the middle of Suburbia after all and I have not yet planted anything to specifically attract more exotic birds to my garden. So assuming this is a common bird, I tried to identify it using the Internet and have come to the conclusion that I need to buy a book! The Internet was not very useful this time, but I finally found what I was looking for. 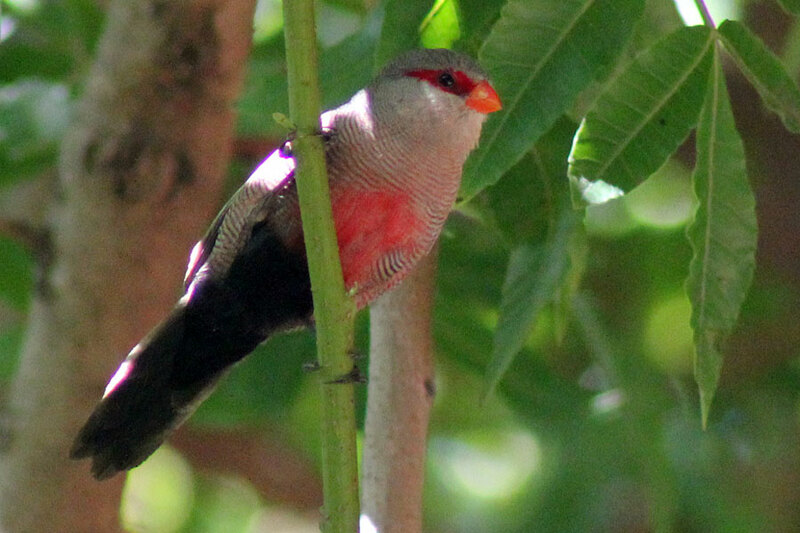 This is a Common Waxbill, also called a Rooibeksysie (“rooibek” translated is red beak in Afrikaans) and they are about 11 – 13 cm in size. The bill, facial skin (eye-stripe) and underbelly is bright red. It is finely barred brown above and pinkish white below. Found near water, on the edge of cultivated fields in grassland and reeds. Common resident. So yes, it is common, but that doesn’t make it any less cute! My garden is always teeming with birds – when we are inside. The minute I step outside they retreat to the highest branches because of my entourage! If I was a bird, I’d steer clear of my entourage too. They are noisy and … well Dexter frightens grown men, so its no surprise the birds are wary. And Sherrie – she yaps a lot so that’s got to be off-putting for the birds too. To do a “Birding shoot” I either have to lock both dogs indoors (which I hate doing) or wait for them to go on play-dates. I’ll have to organise a few more because I do love watching the birds in my garden. 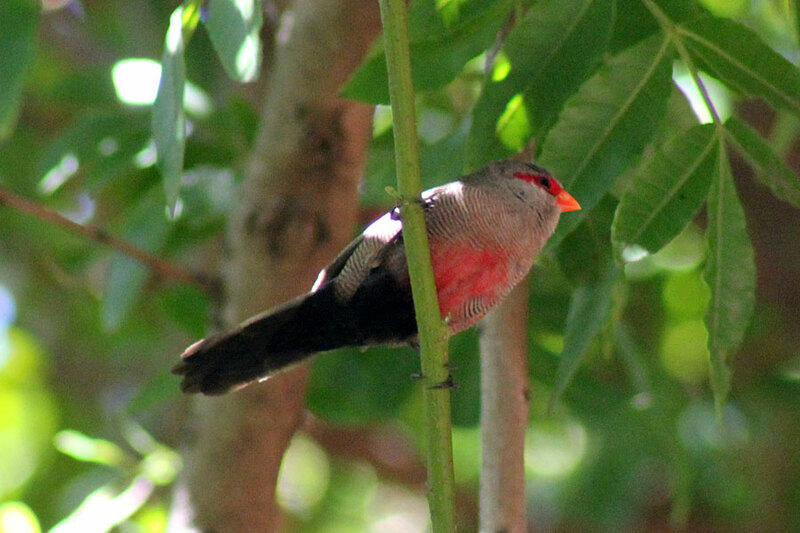 The Common Waxbill (Estrilda astrild), also known as the St Helena Waxbill, is a small passerine bird belonging to the estrildid finch family. It is native to sub-Saharan Africa but has been introduced to many other regions of the world and now has an estimated global extent of occurrence of 10,000,000 km². It is a small bird, 11 to 13 centimetres in length with a wingspan of 12 to 14 centimetres and a weight of 7 to 10 grams. It has a slender body with short rounded wings and a long graduated tail. The bright red bill of the adult is the colour of sealing wax giving the bird its name. The plumage is mostly grey-brown, finely barred with dark brown. There is a red stripe through the eye and the cheeks and throat are whitish. There is often a pinkish flush to the underparts and a reddish stripe along the centre of the belly depending on the subspecies. The rump is brown and the tail and vent are dark. Females are similar to the males but are paler with less red on the belly. Juveniles are duller with little or no red on the belly, fainter dark barring and a black bill. common as in many of your plants are commonorgarden, but you sought them out because you love them! These tiny little birds are enchanting, move fast, and that is a wonderfully detailed picture. In Britain the ‘common’ house sparrow is disappearing. OH WOW!! That is such an amazing cute bird!! 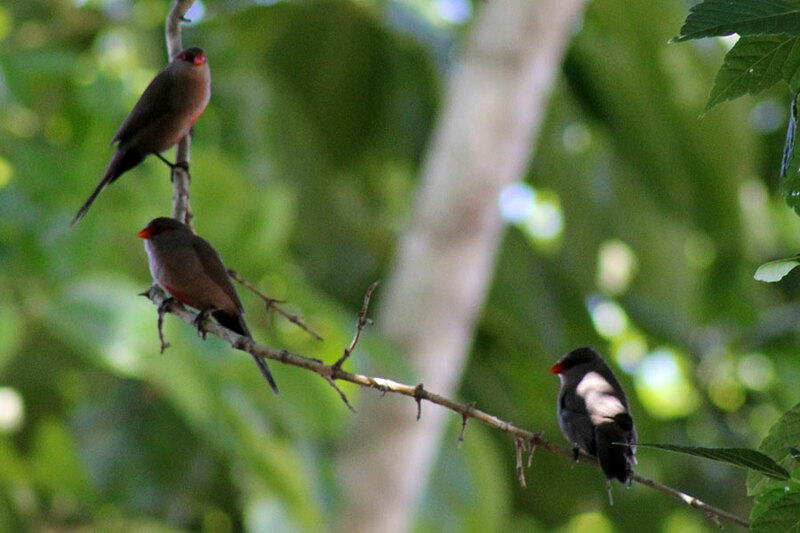 Is THAT a waxbill… !? We don’t see those in our area. Great that you got a shot of the family! You could do with another bird bath in the back, to get them to stay longer – you know, a watering hole lets them linger longer. Too bad you have such drab “common” birds. Beautiful! Do you have a bird feeder? That would surely attract more and possibly make them less nervous when you’re around. I have to admit that once I found out its name I was rather p-o’ed that they called it this. How can anything this pretty be called common. 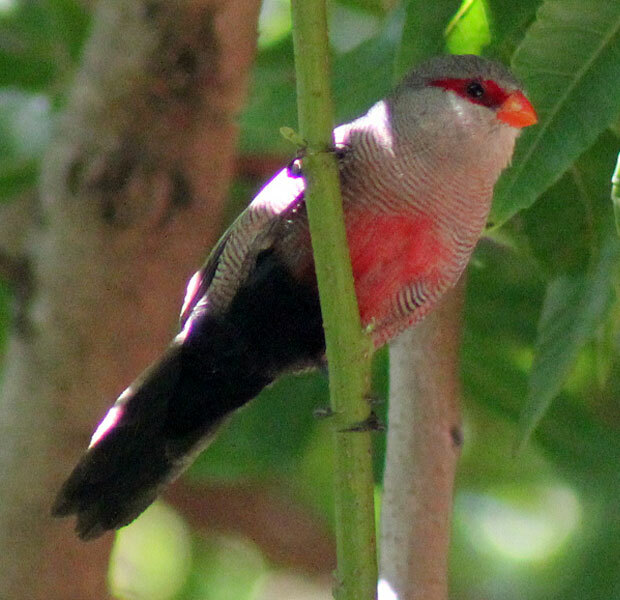 Methinks they could have called it “Red-billed Waxbill” or similar!! I do have a feeder – they never used it before so I moved it to the back garden, added bits of fruit and now they come!! So happy about that. What a beautiful bird! What a wonderful ‘common’ bird to have visiting your garden! I hope you (and your entourage) get to see many more of these pretty birds in your garden.